Dracula is one of the most famous icons of Vampire & horror-related film and literature, and with the original Dracula film released back in 1931, for almost 100 years, the famous “Count Dracula” has entertained millions of people around the world. Dracula: The Video Slot, is a new game from Net Entertainment, that aims to pay tribute to this global hit, and through a direct partnership with Universal Studios, Net Entertainment’s Dracula has become the official Dracula Video Slot game – and it’s become incredibly popular, thanks to the exciting and fast-paced gameplay. The game itself uses a unique set up of 5 reels, 4 rows, and 40 pay lines, and the symbols on the reels include traditional playing card symbols, including 10, J (Jack), Q (Queen), K (King), and A (Ace), as well as Dracula-themed characters, including a variety of characters from the franchise, as well as Dracula, and his Countess. The wild symbol is impossible to miss, and is simply a grey/white background, with “Wild” written in ominous red writing. The scatter symbols are one giant Dracula, and one giant Countess symbol, which appear on reels 2 and 4 only. After you’ve pressed the spin button, before the symbols land on the reels, Dracula – the animated character on the left-hand-side of the screen – can ‘come to life’, and do a dramatic sweep of his arm. When he does this, bats will fly out from his arm, and randomly cover a number of symbol positions – anywhere from 5, to 20. These symbols will then all transform into identical symbols once the reels have landed, and if you can get decent lines (with a bit of luck), it’s possible to do really well in the base-game. 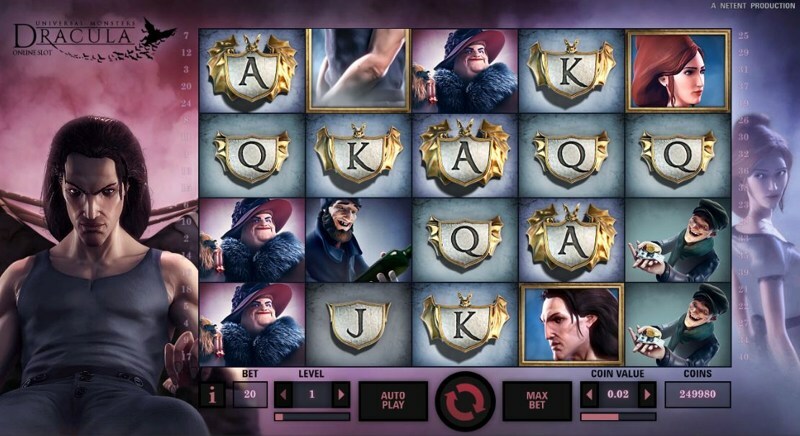 The free-spins bonus is triggered by landing a full giant Dracula and Countess symbol on reels 2 and 4. Once you manage to do so, you’ll be awarded with 10 free-spins, and on every free-spin, the Random Bat Wilds feature will trigger, giving you plenty of chances at a big hit. 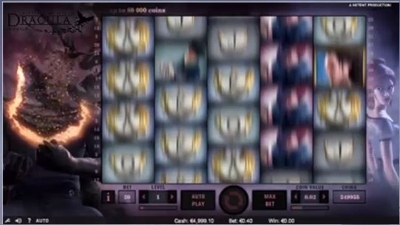 While it’s not possible to achieve a conventional re-trigger, you can earn an extra 3 spins, each time a new, free-spins-only symbol appears in full on the middle reel. The symbol is a graphic of the Dracula and Countess embraced in a hug, and it’s possible to land this symbol multiple times, so it’s possible to increase your free-spins in increments of 3. While the base-game bonus and the free-spins round offers a lot of potential, it’s a little disappointing in terms of the games variance; it’s a low variance slot, which means that – while you’d think you could amass huge wins, unfortunately, it’s a rare case, and similar to Play ‘N Go’s Grim Muerto, it seems the potential is there, but the bonus just doesn’t pay that often. Nonetheless, Dracula is a very well-made game, and it does offer an exciting player experience, so it’s well-worth checking out… even if it’s just for a few lucky spins.